The safety verification of unreinforced masonry structures under horizontal loading due to seismicity or wind is rather complex, if traditional design methods in combination with increased loads as indicated by the new code generation are applied. In doing so, the structural safety cannot be verified even for traditional ground plan configurations, which already have shown their resistance in past events. Therefore, SDA-engineering utilizes nonlinear bearing reserves by using state-of-the-art deformation-based verification procedures considering the nonlinear material behaviour with its post-peak capacity. The procedure is based on the load-deformation curves of single masonry shear walls depending on material combination, wall geometry and vertical loading. 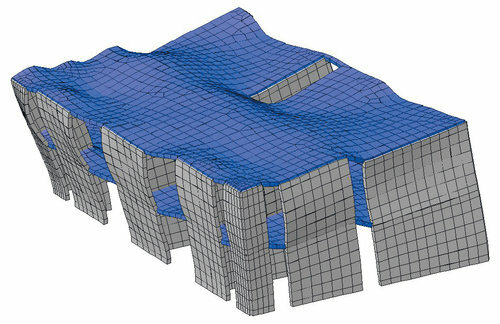 The curves are approximated by means of a bilinear idealization using the initial stiffness, the maximum shear capacity and the ultimate drift capacity according to relevant European standards. The approximation is based on results of more than 60 cyclic shear wall tests which were carried out within the framework of European research projects. The deformation-based verification procedure was successfully applied to prototype and real buildings and verified by independent experts and the building authorities in Germany. The application of the innovative verification procedure allows again the realization of complex buildings in earthquake regions satisfying modern architectural demands at the same time.